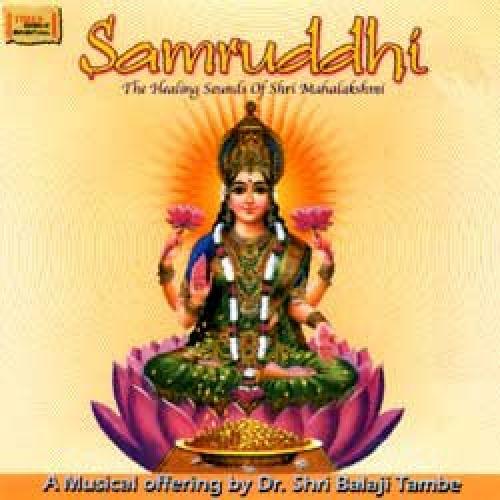 The outcome of years of hardwork and research, "Samruddhi" is an offering from Vaidya Balaji Tamb? to the Goddess of wealth and prosperity - Shri Mahalakshmi. The musical arrangement and compositions evoke the energy of the Goddess, resulting in her choicest blessings to the devotees. According to ancient traditions, a special ritual is performed for solving difficulties and obtaining special blessings from the Goddess Mahalakshmi. In today's times this ritual still has the power to evoke hes choicest blessings. The special ritual (vrat) which is to be carried out for 27 Fridays is as follows. On every Friday, the puja should be offered to a piece of gold, or any ornament, bathe it and then offer haldi (turmeric powder), kumkum (red turmeric powder) and flowers, light a ghee lamp and offer prasad of milk with sugar. Bow down to the Goddess Shri Mahalakshmi and listen to the mantras of ?Samruddhi?. The ritual should be repeated for 27 Fridays and specially on the days of Navratri and on Diwali Lakshmipuja. Project Conceived & Music Composed: Vaidya Shri Balaji Tamb? Vocals: Vaidya Shri Balaji Tamb?